Ooooooh Eeeeeee, I just love me a serial killer thriller and The Silent Girls did not disappoint! We are with the Avon & Somerset Police in this story where loss, wrongful conviction, anger, manipulation, mind games, righting past wrongs and justice are just a few of the themes we come across in this novel. Hells bells! What a fantastic opening! This book delivers the ever important #killerhook and some awesome description that had me sucked in from the get go! For me, this was a fast-paced read and I absolutely LOVED the attention to detail and authenticity that jumped out from the pages. From the setting, to the characters and the storyline, this book just ticked ALL the boxes for what I love in a good serial killer thriller! I definitely got the Silence of the Lambs vibe from this story but not in the sense that this book was trying to duplicate that – rather in the psychology behind the story – and that TOTALLY worked for me. I also LOVED the fact that this was a cold-case police team. The reality is, a lot of murders go unsolved and teams like this are rarely written about – so YAY!! Quid Pro Quo, Mr Young….how the hell did you manage to capture the essence of one of my favourite books without making it feel like a copycat! Absolutely brilliant! If you follow my reviews, you will know that characters are what draw me to a story. They need to be believable, get me invested in them and drive the story. Check, check and CHECK! DS Anna Gwynne (who later becomes Acting DI in the story) describes herself as cool and calculating – interesting description and definitely spot on! She is thought of as the Ice Queen by others (this happens to be my nickname ..hmmmm…), an introvert, confident, very independent, objective and good at analysing situations. OH MY GOD I LOVE HER! There is definitely so much more to this character and I can’t wait to find out all about her in the next book. Hector Shaw – eeeeeeeek! A Hannibal Lector type character who is creepy as hell from the moment the reader meets him. For me, when a baddie can repel you but leave you wanting to know more – you have struck gold and that is EXACTLY what this character does. I certainly hope we have not seen the last of Shaw either! He feeds off Anna Gwynne and this is so bloody fascinating – as this experience is not uncommon in the criminal justice system – I know, I worked in it for 17 years! Manipulative, cunning, with spine-chilling qualities that oddly had me hoping that there was more from this guy…yes, I am a weirdo! DC Jason Holder – awww…a bit wet behind the ears, but there was something very likeable about this guy and he is another character who I hope to see more from in the coming series. I felt we just got a wee teaser/taster of what he is all about. I suspect he will teach Anna just as much as she will teach him! Enter the #baddie – The Woodsman….ooooooh…..another sinister and blood-curling character. Here come the nightmares! I had a list of suspects, (I like to play detective as I read) and although I did eventually work it out – I still had not had the motive pinned down and thought this was ingeniously conveyed as the pieces of the puzzle were put together. Would I recommend this book? Does a bear sh*t in the woods?! HELL YEAH, I would! 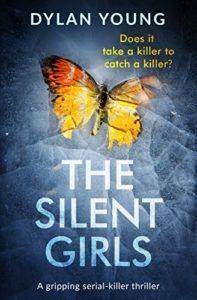 If you enjoy books that combine psychology, menacing baddies, perplexing plot-lines and a great narrative – definitely pick up The Silent Girls as it won’t disappoint! This entry was posted in Book Reviews and tagged #Crime, #Crime #Twists #Murder, #CrimeFiction, #CrimeThriller, #SerialKiller, #Series, #Suspense, #Twists, Bookouture by crimebookjunkie. Bookmark the permalink.